Pily Batt was born in Leon in Northern Spain. She arrived in England with a desire to learn English and experience what then was a completely different culture from her very traditional Spanish upbringing. Living in London in the 1960s she soon met and married an Englishman and settled down to have children and a life in the UK although still retaining her close family ties to Spain. 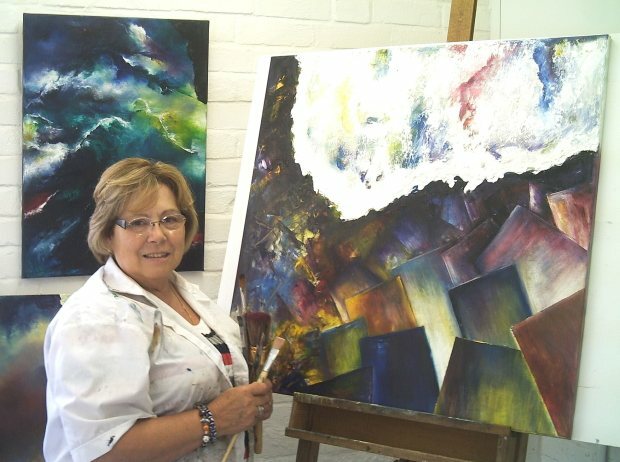 She has exhibited her work in both countries. Over the years she has been commissioned both as a china and oil painter by people wishing to commemorate important events in their lives such as weddings and christenings. Pily also offers classes in art. She can teach you to paint on china or in oils on canvas. Classes are run informally and can be on a week by week basis or as a one off, Her studio is open Wednesday to Saturday to the public but lessons can be held on other days by arrangement. She can usually be found in Studio 5 at The Ginger Piggery in Boyton, Wiltshire. Visit her there or contact her via the contact page.